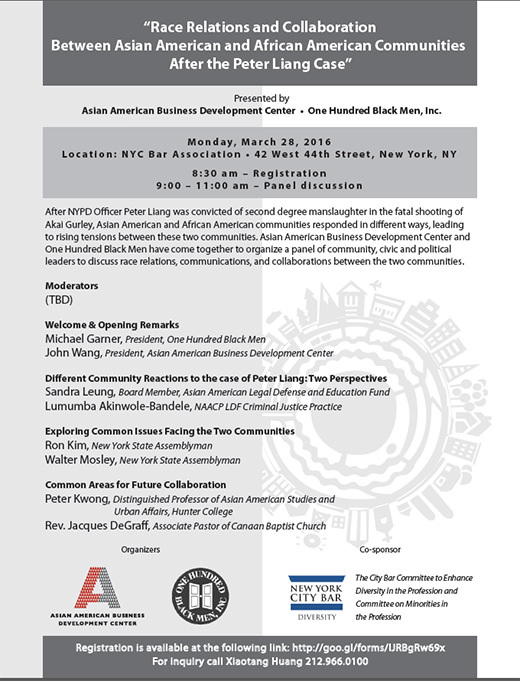 On Monday, March 28, 2016, from 9:00 to 11:00 am at the New York City Bar Association, a panel of community, civic, and political leaders will discuss race relations, communications, and collaborations between the two communities in the aftermath of the Peter Liang case. After NYPD Officer Peter Liang was convicted of second degree manslaughter in the fatal shooting of Akai Gurley, Asian American and African American communities responded in different ways, leading to rising tensions between these two communities. Among the panelists is AALDEF board member Sandra Leung, executive vice president and general counsel of a Fortune 200 global bio pharmaceutical company. A graduate of Tufts University and Boston College Law School, prior to joining the company, she was a prosecutor in the Manhattan District Attorney’s Office. This panel is organized by the Asian American Business Development Center and One Hundred Black Men, Inc. and co-sponsored by the New York City Bar Committee to Enhance Diversity in the Profession and Committee on Minorities in the Profession. Registration begins at 8:30 am on Monday, March 28, at the NYC Bar Association, 42 West 44th Street, New York, NY, or online at https://bit.ly/1LHNPTV. AALDEF’s Feb. 2016 statement on the Peter Liang case can be viewed here.